In 'Barons of the Sea and Their Race to Build the World’s Fastest Clipper Ship,' historian Steven Ujifusa tells a comprehensive, fast-paced tale of the cutting-age technology of the time. Clipper ships were the disruptive technology of their era, reducing travel time on key trade routes between America and China by as much as 50 percent. These “monuments of the ocean” were a towering presence, rising as many as 20 stories from deck to masthead, and their appearance embodied their influence around the world. They were built in shipyards up and down the East Coast of the United States in a race to produce ships that could go as fast as possible, while being able to endure the rigors of long ocean journeys and the violent storms they frequently encountered. Portland-born poet Henry Wadsworth Longfellow was so dazzled when visiting a yard where clipper ships were under construction that he composed a poem about it, “The Building of the Ship,” noting that these majestic vessels were built from lordly Maine pines. 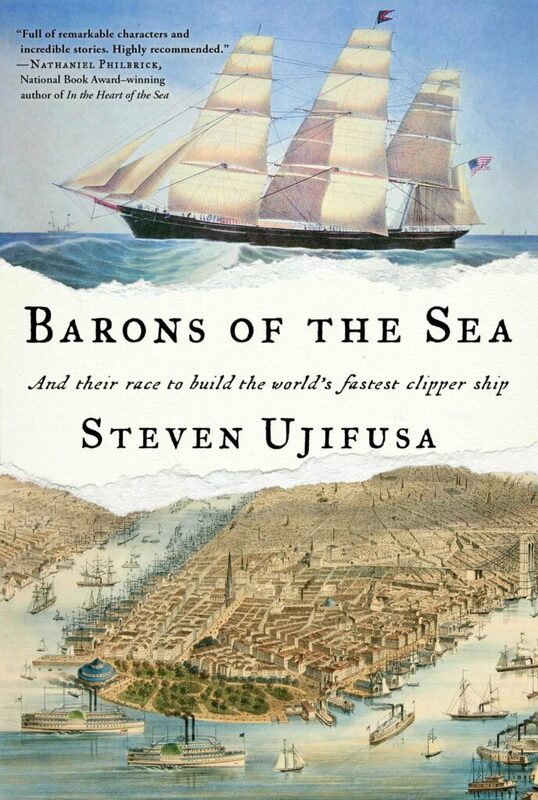 In “Barons of the Sea and Their Race to Build the World’s Fastest Clipper Ship,” Steven Ujifusa, a historian with a keen interest in marine history and impressive gift for storytelling, leads readers on a comprehensive, briskly paced journey through the clipper ship era that delivers far more about the subject than its title suggests. Ujifusa writes about the evolution of clipper ships in the context of global trade, geopolitics and the pre-Civil War United States, and he doesn’t shy away from their role in the opium trade. Building faster ships is a function of both materials and naval architecture, potentially dry topics, yet Ujifusa’s narrative is crisp throughout, and he never lets technical details encumber his storytelling. Ujifusa introduces readers to a number of fascinating people who were part of the clipper ship era. We meet Donald MacKay, a master shipbuilder from Nova Scotia who developed his skills in Newburyport, Massachusetts, before establishing a sprawling, highly productive boatyard in East Boston. Among his many accomplishments, MacKay built the record-setting clipper Flying Cloud. Eleanor Cressy was the navigator for the Flying Cloud on its 89-day journey from New York to San Francisco in 1851. She was an accomplished mathematician with “unmatched finesse with a sextant and charts.” Cressy was a “vital” member of the Flying Cloud’s crew as it “heaved and lurched” through difficult seas that left nearly all on board seasick. During the record-setting voyage, crew members quarreled among themselves, and the Flying Cloud endured “hard gale, wind and sleet” when rounding Cape Horn at the southernmost tip of South America before sailing up the west coast of the continent and on to San Francisco. The Eleanor Cressy-navigated Flying Cloud’s speed record from New York to San Francisco was not broken until 1989. Warren Delano II, was a China trader whose “clan had been risking their lives on the high seas ever since (the time of) … the Plymouth Bay Colony in 1621.” Delano is one of several businessmen from the northeast United States who made vast fortunes using clipper ships to trade with China. Opium merchants like Delano rationalized their involvement in the trade with all-too familiar arguments for ethical misconduct based on relativism (opium is not as bad as alcohol, and alcohol is legal); the assertion that ‘everyone else is doing it’ (the British were leaders in opium sales); and deflection: The real problem, they contended, was corrupt Chinese government officials. After the Civil War, the era of clipper ships began to fade with the arrival of steam ships, which provided a more comfortable voyage that did not depend on fickle winds. Completion of the transcontinental railroad heralded the end of clipper ships for domestic trade because freight trains could make the journey from New York to San Francisco in 10 days instead of the 100 days for a fast clipper ship. Like other clipper ship barons, Warren Delano amassed a fortune ensuring wealth for generations. Over time, the opium-trade-origins of the family wealth was off limits for discussion, but its power and influence continued. In March 1933, Warren Delano’s grandson, Franklin Delano Roosevelt, was sworn in as 33rd president of the United States. He kept a model of a clipper ship prominently displayed in his office. Dave Canarie is an attorney and adjunct faculty member at the University of Southern Maine.